The Rams, Patriots, Chiefs, and Saints have imposed their will on their opposition and are paving their paths toward the playoffs. 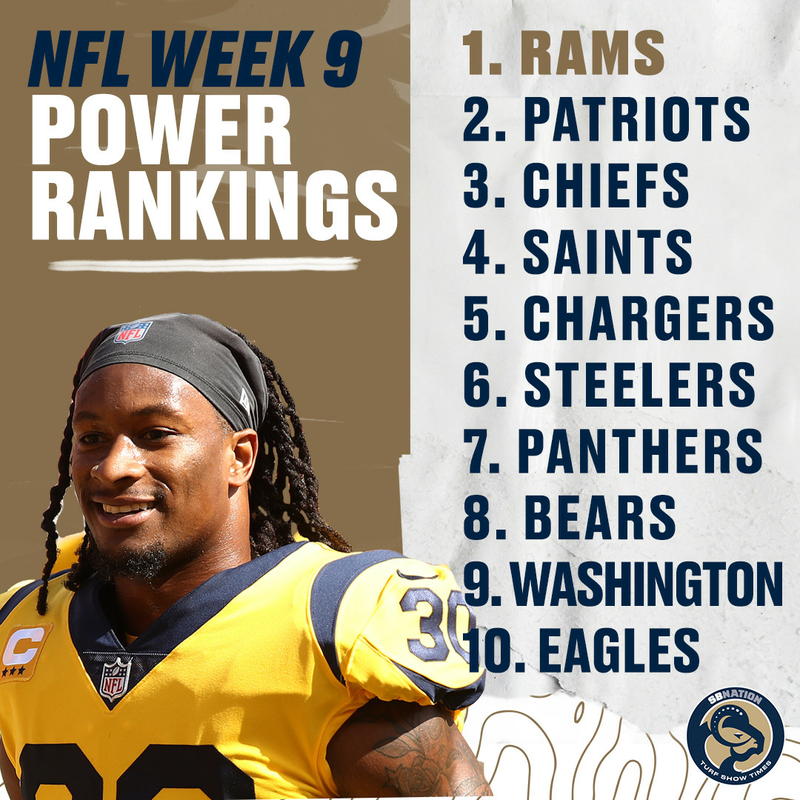 Those teams make up the top four of our Week 9 NFL power rankings with the Chargers placing fifth following their bye week. The 8-0 Rams just keep winning and though the Packers came close to beating them, Los Angeles kept their streak alive. Next up for the Rams will be the Saints. Will LA remain undefeated coming out of Week 9? The Packers took a two-spot dive this week after losing to the Rams. You can’t really fault a team for losing to the Rams, but the Packers (much like the Vikings) don’t have an impressive win as their victories came over the Bears (by one), the Bills, and the 49ers. The Rams are the lone undefeated team in the NFL, but they are convinced that there’s plenty of room to improve. And they’re correct, starting with the defense. The D has come through in the clutch on several occasions, notably in victories over the Chargers and Vikings. But it is the 13th-ranked defense in the league, and at times it has been susceptible against the run and more recently against the pass. 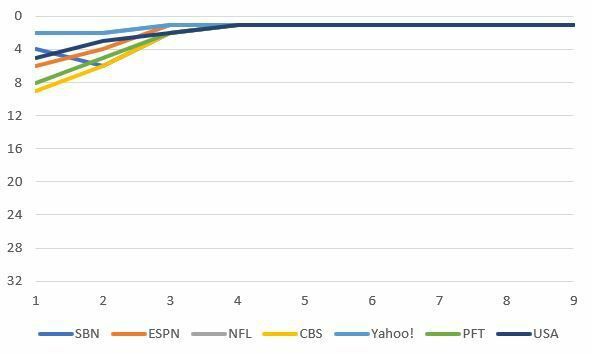 The sign of a great team, a Super Bowl team, is when it doesn’t play anywhere near its peak performance … and still wins. That was the Rams on Sunday. The defense got rolled early, putting Los Angeles behind the, er, 12-ball at 10-zip. As he always manages to do, Sean McVay deciphered the Rubik’s Cube, leaning on Todd Gurley more on early downs to keep an uber-aggressive Packers defense honest. On that front, Gurley somehow piled up nearly 200 yards from scrimmage and a touchdown after a rough start. The focus on Gurley allowed Jared Goff to deliver perfect strikes on intermediate throws against single coverage, which is so difficult to stop (or even hope to stop). Side note: Gurley could’ve padded his tally with another score late. He deliberately rammed into a tackler instead, ignoring the goal line in order to help prod the clock to 0:00. It was reminiscent of the first guy I ever saw do that: Brian Westbrook of the Eagles during a late-season win at Texas Stadium back in 2007. Strategery. The sign of good teams is that they find a way to win games when they don’t play as well as expected. The Rams did that last week to stay undefeated. We almost had our first moment to second-guess Sean McVay. Late in the fourth quarter, the Rams trailed 27-26. They ran on second-and-20 and third-and-16, essentially settling for a field goal. Had Ty Montgomery just taken a knee on the ensuing kickoff, like he was reportedly told to do, Aaron Rodgers would have had two minutes to drive for a game-winning field goal. We’ve seen Rodgers pull that off many times before. But Montgomery fumbled and the Rams’ give-up runs didn’t matter. McVay isn’t conservative often, so him going into a shell and opening the door wide open for Rodgers to steal a win was pretty shocking. Win the next three, and it will be time for the ’72 Dolphins to start getting a little antsy. Trick — shame for Todd Gurley owners thinking they’d be treated to a second TD when L.A.’s RB put LT record pursuit on hold for good of his team.